With this latest attempt to manufacture a dramatic story out of nothing, Ha'aretz continues in its efforts to influence — as opposed to report — news. After having earlier described Jerusalem's Jewish Quarter, including the Western Wall, as "disputed area . . . on the agenda during negotiations with the Palestinians," and after having erroneously claimed that for the last seven years Christians and Muslims from the Palestinian areas are prohibited from entering the Temple Mount, as are east Jerusalem Arab men, the newspaper yet again displays complete ignorance regarding the holy city, and/or deliberately seeks to make a mountain out of a mole hole. Regarding this weekend's headline, one must ask the editor: When was the "Little Kotel" ever closed to Jews? For decades the the Little Kotel has been open to everyone — Jews, Christians and Muslims alike -- and it serves as a prayer site for Jews praying individually and in a prayer quorum. The Little Kotel became a popular prayer site primarily after 1972, but Jews prayed there even before then. According to journalist Nadav Shragai, a former Ha'aretz reporter who is currently writing a book on the Little Kotel, Jews prayed at the site even prior to 1948. He notes in his book that both Menachem Porush, a deceased ultra-Orthodox Knesset member who was born in 1916, and Avraham Shapira, a former chief rabbi of Israel born in 1914, prayed there as children. Moreover, during the Arab rebellion of 1936-39, when Jewish access to the (large) Kotel was restricted, Jewish worshippers moved their prayer site to the Little Kotel. The headline is particularly absurd in light of the fact that the accompanying article by Akiva Eldar even mentions the fact that Jews already pray there, and that students of the Ateret Yerushalayim Yeshiva conduct their afternoon services there every Shabbat. According to Ha'aretz, the reason for the change in the status quo was the Jerusalem Development Authority's removal of scaffolding that has been there since 1972. The scaffolding supported a house which was feared might collapse due to digging in the Kotel tunnels. 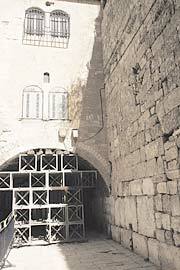 During the course of the work, city workers accidentally drilled a number of holes into the Kotel itself, which caused a storm not only in the Jewish religious world, but also among officials in the Waqf (the Muslim religious authority), and Muslims who regard the Kotel as "al-Baraq," the site where Mohammed tied his horse during his night journey to heaven. After the interreligious public outcry, the municipality and police decided not to undertake any change in the Little Kotel area. This, despite the fact that the scaffolding had long since finished serving its purpose and there was no longer any need for it. Moreover, the scaffolding blocked most of the alleyway leading to Arab homes in the area and the residents were forced to walk through the scaffolding in order to reach their homes. In the framework of preservation work on different monuments around the Old City, the Jerusalem Development Authority also decided to undertake work in the Little Kotel area, an important site by all accounts. In a conversation with Presspectiva, CAMERA's Hebrew Web site, officials from the authority explained that this year 30 to 40 similar improvement projects are being carried out throughout all the quarters of the Old City according to the annual plan. Five of them are currently underway. The work is implemented with permission from the relevant authorities. Is Ha'aretz Looking to Provoke a New Riot? So what do we have here? First, an erroneous and misleading headline which reveals a total lack of understanding concerning the subject matter. Second, rather than reporting in an inside page on the improvement of the life of a few Arab families residing in the Muslim Quarter as a result of the removal of unnecessary scaffolding, Ha'aretz irresponsibly tries to ignite the area with a bombastic front-page headline, feeding into anti-Israel claims that "the Zionists want to destroy Al-Aqsa." It is also impossible to ignore how veteran Ha'aretz reporter Akiva Eldar describes the two NGO's mentioned in his report — Ateret Cohanim and Ir Amin. While he dubs Ateret Cohanim a "right-wing organization," he calls Ir Amin simply "the non-profit organization Ir Amin," as if it were an apolitical non-profit working completely objectively. Ha'aretz is so skewed that editors do not even realize that special treatment is accorded to leftist non-profits even though they have just as much a political agenda as those on the right. If Ha'aretz journalists are interested in writing about changes in Jerusalem's status quo, they could write about real news, such as the destruction that the Waqf has wrought on the Temple Mount for more than a decade. Since 1990, and especially since 2001, heavy and destructive equipment hauled away thousands of tons of Temple Mount rubble rich in archeological finds from several time periods. All this to build an underground mosque in the area known as Solomon Stables. Beyond the fact that Waqf officials broke the antiquities law and the planning and building law, they destroyed a huge amount of valuable archeological finds in one of the most important places in the world for the three monotheistic religions, out of total disregard for the cultural, historic and religious value of the relics. These criminal acts, out in the open for all journalists to see, are a clear example of the violation of the status quo. When was the last time Akiva Eldar wrote about the Waqf's destruction of the Temple Mount, and when was the last time it appeared in the leading headline of the newspaper where he works? What reason in the world does Ha'aretz have to ignore real news in favor of mutating a non-story into another source of unjustified international condemnation of Israel? Whatever the reason, it has nothing to do with journalist integrity or adherence to factual accuracy.